Platinum Advantage Guaranteed Standard Issue income protection insurance can be a game-changer for employers who offer long term disability insurance. Help them improve recruitment and retention with more benefits for highly compensated employees. LTD insurance is designed to replace 60 percent of an employee's base salary, but it's often capped at a lower monthly amount. For highly compensated employees, this amount won't cover their income protection needs, resulting in a coverage gap. 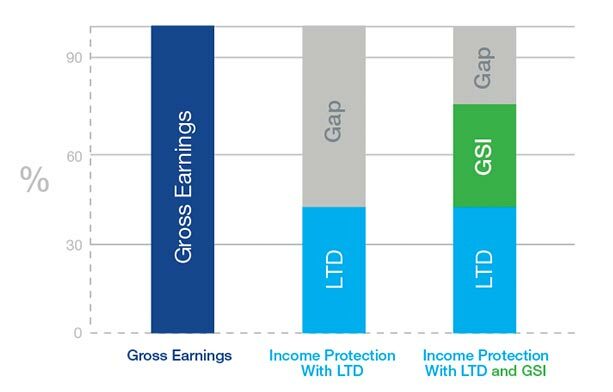 Employers who offer Platinum Advantage GSI can help raise the coverage amount, which is especially appealing to high earners. A big plus is that bonuses, distributions and other incentive income are covered earnings. Assumes LTD plan of 40% income replacement to a $10,000 monthly plan maximum, coordinating with a GSI plan design of 75% replacement to a $10,000 monthly plan maximum, for a combined coverage maximum of $20,000 between plans. This graph is intended for illustrative purposes only. This graph is intended for illustrative purposes only. Platinum Advantage GSI is not available in California. Protector PlatinumSM Guaranteed Standard Issue is the available product in California. Platinum Advantage GSI is available in all states except California. Protector Platinum GSI is only available in California. FL, MT, NY, ND and SD. A complement to GSI, our LTD plans include a number of features that help and encourage your clients' employees to return to work as soon as possible. We've designed flexible income protection plans for a broad range of clients. Contract your General Agent to learn more about Platinum Advantage GSI.